Café Germain is a very unique café designed by India Mahdavi, it has two storey floor with several rooms that has different function. The interior design has several different templates, color, pattern and texture. The ground floor has a function as a main salon of the venue, a restaurant and a bar. 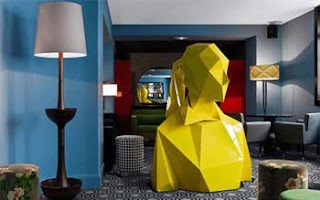 In this rooms we will find a check board patterns floor, a bar with polygonal pattern, a dining room with a mix matched furniture, a grey wall with a long window, a rectangular black and white ceiling, a spherical lighting and a lower part of the giant yellow sculpture by Xavier Veilhan. In the upper floor the rooms is designed for private parties and gatherings. 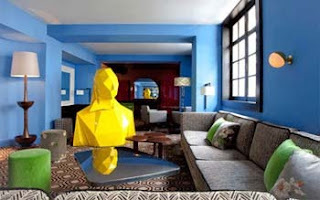 This rooms is filled with blue wall, retro printed carpets, several different lighting fixture, a retro printed furniture and the upper part of the massive sculpture. 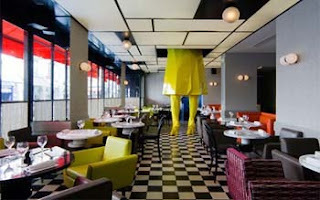 One of the elements that becomes the vocal point of this café interior is the massive yellow sculpture created by Xavier Veilhan, This sculpture spreads across the two floors of the restaurant. 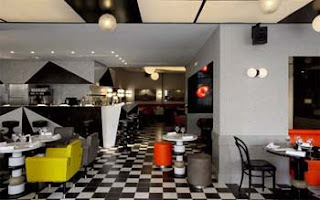 The Iranian born and Paris based architect in charge of the interior design India Mahdavi successfully creates a decorative retro theme for Café Germain.